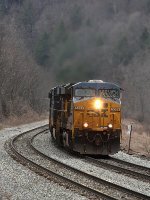 Description: CSX ES40DC 5399 trails on Q574 North. Description: Westbound CSX freight by the B&O CPL signals at East Aiken. Description: CSX freight Q405 westbound by the B&O CPL signals at East Aiken. Description: Q703 comes west on 2, this short edition being led by a GEVO/SD50-2 combo. Description: Q439 sits on 1, Q702 sits on 2, and Q703 pulls up to the stop signal on 2. He'll receive permission past it and onto the number 3 track. Description: This relatively clean derated SD50 is second out on Q703. Description: New-age GE power on an eastbound intermodal train passes the old reliable EMD GP40-3 of the Wheeling and Lake Erie Railway. The stealthy-looking #300 is former NYC 3044, CR 3044, CNW 5532, and UP 652. Built in December 1965. Title: Eastbound TOFC at CP 58. Description: Eastbound CSX train L034 with 5399 leading on number 2 track at Rossville MD, Philadelphia Subdivision.